Anne Bradstreet, originally Anne Dudley, was born in 1612 at Northampton, England. Anne was the daughter of Governor Thomas Dudley, leader of volunteer soldiers in the English Reformation and Elizabethan Settlement and steward to the Earl of Lincoln, and Dorothy Yorke Dudley, a gentlewoman of noble heritage and well educated. At the age of sixteen, Anne married Simon Bradstreet, a twenty-five year old assistant and future governor of the Massachusetts Bay Company and the son of a Puritan minister, who had been in the care of the Dudleys since his father's death. Anne and Simon emigrated to America along with Anne's parents in 1630 aboard the Arabella. The journey was tough, many died while others became sick with scurvy brought by malnutrition. After landfall in the colonies, many soon perished or elected to head back to England claiming they have already been through enough. Thomas Dudley, along with his friend John Winthrop, set up the Boston settlement's government with Winthrop as Governor and Dudley as Deputy-Governor with Anne's father as Chief-Administrator. Many colonists fought for survival through the harsh climate, lack of food and primitive living arrangement. Anne was one of them. She came ill as paralysis had set through her joints. However, Anne did not lose her will for living. She and her husband had eight children, which she loved dearly. As Simon prospered in their new home, life looked to only get better. Sadly, the families home was destroyed by flames leaving them homeless with hardly any personal property. Luckily though, the family soon got back on their feet due to Simon's hard work and social standing in the community. As with all political officials, Simon spent many days traveling to various colonies on diplomatic missions. This left Anne much time with her father's vast collection of books and time to educate her children. The reading allowed Anne to learn much about religion, science, history, arts, and medicine while dealing with the colonies way of life. 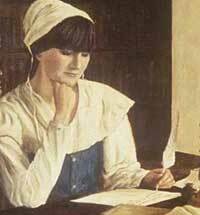 Anne Bradstreet's favorite reading material was that of poetry, which she began writing herself. Her poems and views were kept private amongst her close friends and family as women seeking intellectual enlightenment was looked down upon. A friend, Anne Hutchinson, was banished by the community because of airing her views publicly, Bradstreet did not want to make the same mistake. Anne's brother-in-law, John Woodbridge, had secretly copied much of her work and brought it to England and had it published without her permission. Woodbridge admitted to this deed in the preface of Anne's first collection of poetry The Tenth Muse Lately Sprung Up in America, By a Gentlewoman of Those Parts, which was published in 1650. This was also the last publication of her works until after her death. Anne Bradstreet's health was slowly deteriorating as she became afflicted with tuberculosis. Shortly after contracting the disease, her daughter Dorothy also became ill and died shortly after. Anne found solace and acceptance of her own death by believing her own daughter had gone to a better place. At the age of sixty, Anne Bradstreet passed away on September 16, 1672 in Andover, Massachusetts after a long battle with illness and was buried in the Old Burying Point in Salem, Massachusetts. The Author to Her Book. Anne being embarrassed that her work was published before editing it. Before the Birth of One of Her Children. Bradstreet speaks about death. Contemplations. About humanity, nature, and God. The Flesh and the Spirit. She conveys the two with voices as different personas. To My Dear and Loving Husband. She speaks of her love. The Prologue. Her struggles as a women in a puritan society. The Vanity of All Worldly Things She speaks of materialism. Verses upon the Burning of our House, July 18th, 1666. Her grief over her house burning.